An £8million scheme to build more than 50 new affordable homes on Arran has been unveiled. Three sites are to be developed after government funding was secured by the new Arran Development Trust in a major step forward for proposals which could see 56 social needs houses by the spring of 2021. And this could just be the start for the Trust is in the process of setting up an Arran-based housing association to develop social needs housing around the island in the next decade. The Trust is the operational arm of Arran Economic Group who have been working towards the provision of good quality affordable homes for the community on Arran. 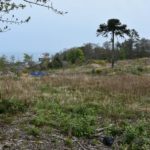 In the past two years they have produced a housing study and commissioned feasibility study work on identified potential suitable development sites to provide up to 200 new homes, extending a choice of affordable options for the Arran community. The Trust recently lodged Expressions of Interest with the Scottish government rural and islands housing fund for five development sites. However, due to the time constraints of the fund and the need to deliver the project by March 2021, the fund have given approval for the Trust to move forward with three of the sites to the next stage, which is firming up the feasibility studies and costs to support the main fund application. All of the sites are in Lamlash and Brodick and while two of the sites have already undergone in-depth feasibility work, which now needs to be updated, and the other sites needs to have the same treatment in feasibility terms. Simultaneous applications will be drafted to the Scottish Land Fund in order to purchase the land from owners. While most of the houses will be built for rent, a small number on one site of around 14 would be self-build, with support from the government, which is still being firmed up. However, the man who has worked tirelessly to make this happen, the chairman of the Arran Ecomonic Group Tom Tracey, said it was important that anyone interest in social needs housing to get their name on the common housing register now, even if they are already in private rented accommodation. Chairman of the Arran Development Trust Barry Mochan said: ‘This is a fantastic testament to the work undertaken to date and the focus very firmly on the future sustainability of the island of Arran. We are excited to have reached this important milestone and look forward to the next stage. ‘All this would not have been possible without the support of the housing, planning and economic support from North Ayrshire Council who have been behind us every step of the way. ‘The 56 new units, combined with the 34 new homes planned by North Ayrshire Council for Brathwic Terrace and the 20 proposed by the Trust Housing Association in Brodick, will make a tangible difference and take positive major leaps forward in giving much needed affordable home choices for Arran residents and folks who want to move to Arran for work. ‘Over the next few months, there will be a lot of work going on with feasibility studies, consultant reports and firming up of costings,’ he added. That work is expected to be completed by next spring when the Trust will go back to the goverment with detailed proposals with a view to start the planning and development phase. He said the new housing association, which would be based on Arran, would also be an employer and would provide jobs from construction to the running of the houses themselves. He said they would be working closely with Skills Development Scotland and Arran High School. The Arran Development Trust is now a fully constituted body with charitable status and a membership organisation. As such is open to membership with a £10 joining fee and £1 annual subscription. The Trust has organised their first community meeting on Wednesday December 5 in the Ormidale Pavilion in Brodick from 12noon to 2pm to outline the work and values of the new organisation and invite all Arran folks to come along and find out more and learn how to become members.